Dr. Ching and his personally trained staff assess which facials will best meet your skin care requirements. Precision Aesthetics offers the newest and most effective extractions, microdermabrasion, masks, and peels. Not all facials are created alike. Dr. Ching and his personally trained staff assess which facials will best meet your skin care requirements. 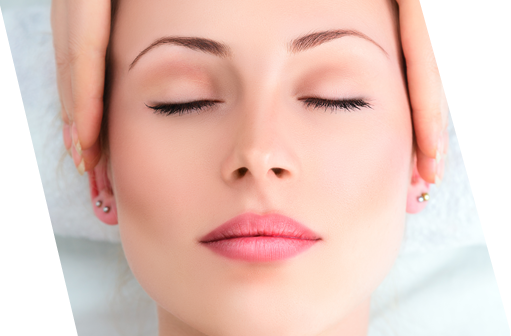 Precision Aesthetics offers the newest and most effective extractions, microdermabrasion, masks, and peels. Ossential® Stimulator Treatment can be a must for skin that feels rough or looks dull, as it makes use of a new, unique combination of exfoliating ingredients to renew and revive skin. With no downtime, this may be the ultimate results-oriented treatment that many of you have been looking for. Indicated for All skin types / Approximate Time 30 minutes / Optimum Results – Once a week for a month / Maintenance Once every four weeks. Ossential® Ultra Hydration Treatment aims to target dry, dehydrated skin to hydrate, restore and calm. This treatment can provide a soothing, cooling comfort that can calm and soothe all skin types. Indicated for dry, dehydrated, weak skin / Approximate Time: 50 minutes / Optimum Results: Once every 4–6 weeks / Maintenance: Every 4–6 weeks / You should not exceed 12 weeks between treatments. Ossential® Skin-Brightening Treatment can target pigment-related issues to help address dark patches and uneven skin tone. Indicated for Hyperpigmentation / Approximate Time: 50 minutes / Optimum Results: 6 treatments, spaced 3–4 weeks apart / Maintenance: Every 4–6 weeks / You should not exceed 12 weeks between treatments. Offects® Acne & Oil Control Treatment can help to clear skin and prevent breakouts. Indicated for Acne, oily skin, rosacea / Approximate Time: 50 minutes / Optimum Results: 6 treatments, every 3–4 weeks / Maintenance Every 4–6 weeks / You should not exceed 12 weeks between treatments. Dr. Zein Obagi, the inventor of the Obagi Blue Peel®, continues to develop new, innovative peels aimed to suit patients’ skin objectives, conditions, and lifestyle. ZO® Signature Peels exfoliate and may also provide dermal and epidermal stimulation, to stabilise skin functions and support skin renewal. *Disclaimer: Any information or advice published or made available through this website are not intended to replace the services of a qualified physician or those of a healthcare professional acting under a doctor’s supervision. In no way does it constitute a doctor-patient relationship. Each individual’s treatment and/or results may vary based upon the circumstances, the patient’s specific situation, as well as the healthcare provider’s medical judgement. Treatment will be based on further discussion of the patient’s specific situation, goals, risks and benefits and other relevant medical considerations. Testimonials made by any person(s) on this site are not intended to substitute for this personal discussion or evaluation and are not intended to act as a guarantee as to outcomes. Examples of treatment results on this website are not meant to convey any warranty, either express or implied, as to outcomes, promises or benefits of any treatment. A patient’s decision to accept any treatment should be assessed carefully by the patient, including the risks and benefits of any procedure and taking account of discussions and assessment provided during a consultation with a healthcare professional. Epidermal Renewal, with Invisible Exfoliation. 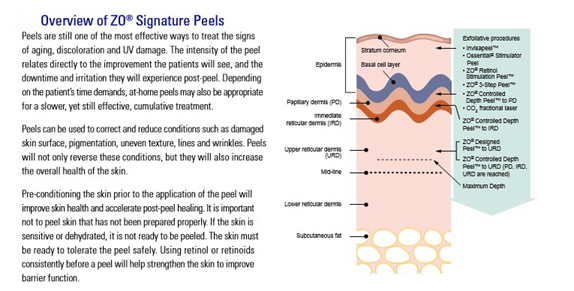 Invisapeel™ Intensive Resurfacing Peel is an at-home peel formulation. It uses a novel combination of papain and bromelain plant enzymes in, combination with glycolic acid, to exfoliate the surface of the epidermis. It can help to improve skin texture and tone. It can be a safe and well-tolerated ZO® peel that shows no apparent signs of exfoliation and it can be used by all ages, skin types and conditions. This at-home treatment can break down the stratum corneum, allowing faster treatment results if additional ZO® products are used. It can also allow for deeper benefits from any ZO® treatment protocol. Moderate Exfoliation and Texture Improvement. ZO® Retinol Stimulation Peel™ can be a safe, easy peel that can be performed at home by applying Ossential® Advanced Radical Night Repair in the AM and PM for 3–5 days. This peel can provide superficial exfoliation, promote cell turnover and stimulate deeper cellular activity for firmer, more even-toned skin. It may improves the appearance of the skin, and also support the skin’s ability to repair and renew itself. Aggressive Exfoliation and Dermal and Epidermal Stimulation. The ZO® 3-Step Peel™ is a multifunctional epidermal peel designed to provide longer-lasting treatment benefits. Utilizing a blend of exfoliants, a 6% concentration of retinol and multi-action agents that stimulate collagen and restore moisture balance, it can even skin texture for softer, smoother, tighter- looking skin. The ZO® 3-Step Peel™ can be an innovative in-office treatment followed by an at-home retinol treatment designed to support dermal and epidermal stimulation. Maximum Skin Tightening and Mild Skin Resurfacing. The ZO® Controlled Depth Peel™ can be a robust in-office dermal peel using TCA with multi-action components for intense exfoliation and skin renewal. It can be used to medically treat various skin conditions, including acne, wrinkles, fine lines, rough texture, pigmentation disorders and sun damage. Enriched with lipid supplements, skin irritation modulators and antioxidants, this innovative peel base can help replenish skin barrier function and minimize post-peel cell-damaging oxidative stress.